This NEW powerful self hypnosis MP3 will give you the confidence you need to finally overcome Migraines! Hypnosis is a viable alternative to pain medication, even for those who have suffered from migraine headaches for years. Migraines are triggered by certain events and are classified as a type of headache that usually starts on one side of the head or the other and lasts for between 4 and 72 hours. There is currently about 13% of the population in the U.S. or 28 million people who could be getting relief from their migraines through hypnosis. The Address Migraines Hypnosis MP3 can help you overcome migraines. Hypnosis is effective in treating migraine headaches because it can focus on the triggers that lead to the onset. When the veins and arteries around the brain get inflamed, the symptom is often a migraine headache. Inflammation can occur from the consumption of alcohol or caffeine, but it is most often set off from tension, fatigue and emotional stress – three areas effectively managed through hypnosis. Emotional stress and tension are controllable and through hypnosis, you can learn to deal with them before they trigger a migraine headache. Hypnosis is able to induce a state of relaxation equivalent to the way the body relaxes just prior to drifting off to sleep. While in this state, thoughts and emotions alike are sorted through and organized. The mind is placed at ease and emotions are put into perspective. Steve G. Jones has created the Address Migraines Hypnosis MP3 session. 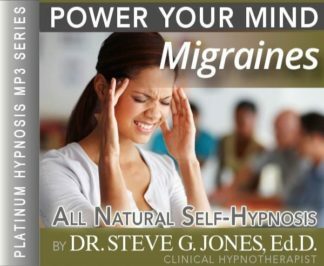 His training as a board certified clinical hypnotherapist enabled him to come up with a truly effective, drug-free way to prevent and manage migraine headaches with hypnosis. LEARN HOW TO COMBAT MIGRAINES WITH HYPNOSIS!!! Steve G. Jones, Ed.D., Clinical Hypnotherapist, charges $1,500 for a custom recording and $25,000 for a one-hour private hypnotherapy session at his office. But you can get all the benefits for this low price. Simply listen to the Address Migraines Hypnosis MP3 download every night as you go to bed for three weeks and feel the changes happening in your life. You will feel more empowered, more in touch with your true self, and you will truly know that your goals are within your reach. It is approximated that about one-fourth of the population suffers from migraines. As you probably know, the most common symptom is a severe headache, but other symptoms include: nausea, vomiting, sensitivity to light, sensitivity to sound, and having an aura (a symptom affecting your visual field). If you think you might be suffering from migraines, the first thing you should do is see your doctor to receive proper diagnosis. I was doing some research this past week and I read about a study that was performed on 28 children suffering from migraines. The study lasted for nine months where the participants were given either migraine medication (propranolol) or a placebo for the first six months. The researchers involved in the study taught the children how to use self-hypnosis and the children used the technique on themselves for three months. The study showed that the average number of migraines the children had during the propranolol phase was 14.9 headaches. During the placebo phase, the average was 13.3 migraines. Lastly, during the self-hypnosis phase, the children had an average of 5.9 headaches. The research concluded that there was a strong correlation between reduction of migraines and the usage of self-hypnosis. You are so very relaxed now and just drifting and floating, that’s right. And you realize now that you will get regular exercise. You have a very strong desire to exercise, that’s right. You are so relaxed and at ease at all times in your life. And you keep regular sleep patterns, that’s right, regular sleep patterns. You pay attention to what you eat, that’s right. You pay attention to what you eat. You watch for certain triggers, that’s right. You pay very careful attention to what you eat and you may even keep a diary of what you eat so that you can identify certain triggers. You eat regularly, that’s right. You eat regularly. You manage your stress in a very calm way, that’s right. You feel stress bounce off and away from you because you are protected and any stress that comes from the inside, feel that stress draining away from you through the bottom of your feet. Feel that stress draining away from you right now through the bottom of your feet, that’s right. Stress always leaves your body allowing you to be a very relaxed person, very relaxed, very relaxed, very relaxed. Migraine headaches can cause debilitating symptoms, but realize that hypnotherapy can help prevent and overcome migraines. Hypnotherapy works by targeting your subconscious mind to relax and work on preventing future migraines from occuring. Self-hypnosis is a powerful and natural way to cope with migraines and prevent them in the future. You will want to listen to the Address Migraines Hypnosis MP3 recording every night for 21 nights in a row before going to bed. At first, you might also want to listen to the recording when you are experiencing a migraine. This hypnosis session is designed to help you overcome the migraine and prevent them from occurring later in the future. You will be given suggestions that will help you overcome migraines once and for all. This hypnosis session will also help you make lifestyle changes that may be contributing to your migraines. Hypnosis makes it easier for you to make these changes, because hypnosis targets your subconscious mind and you will not be aware of the changes you are making to your current lifestyle.